The Art Miles Mural Project began in 1997 and sought official recognition from UNESCO in 2001. We were also designated a project for the International Year of World Cultural Heritage. With the goal of creating global harmony through art, we set about creating one mile of murals painted on canvas with the multicultural -diversity theme. Since that time we have launched twelve miles of murals and completed about 25% of them with over 20,000 participants from over 100 countries. There are 440 murals in each mile and we will need 5,280 to complete the twelve miles. We have also launced several special mural miles including the 500 foot Manhattan Memorial Mural, the To Beslan With Love series of Murals, and now the Tsunami Series of Murals. Our murals have been painted by school children, senior citizens, in villages, towns and cities all over the world. Our progress has become to spread rapidly via the increase in Mural Marathons. In the year 2000, we created 30 murals with participants from the UNEP ICCE in Eastbourne, England, in 2001 we created a 120 foot mural with 1200 k-3rd graders at the Jack Jacter Elementary School, 2002 we created 75 murals with over 1505 children from the City of Mexico City at the Great Pyramids of Teotihuacan, in 2003, 110 murals in Valencia, Spain under the direction of Dr. Angel Escudero, in Vienna, Austria with the Technical Museum and 750 children, and during World Peace Day at the World Prayer Society in Amenia, Central Park and other New York locations. Mural Marathons are being created under the direction of Fauzia Minallah from the Funkor Art Center in Islamabad, and the renowned architect Yasmeen Lari in Pakistan at National Historic Sites. Although it may appear that completed numbers of murals are benchmarks or indicators, our passion remains to bring people together through art. We hope to create a mid Decade event in Egypt this year, and will be unveiling the completed and beyond Environmental Mural Mile in Denver, Colorado on Earth Day, April 22, 2005 in that city. Our murals are created by people of all ages, including those who have physical and mental impairments. We paint murals with war victims, traumatized people, homeless, the incarcerated and those who simply love art and children. the Decade of the Culture of Peace has no real ooomph or visible support from UNESCO and other UN organizations. We peacemakers seem to advocate eachother for one another! David Adams is hidden away in CT and there seems to be no one else overseeing what his passion continues to do to keep us alive and connected! Funding. Even a token amount! Our project is totally volunteer and staffed by about a dozen of the most dedicated, passionate and loving volunteers imaginable. My husband and I were the primary funders for this project and it has now evolved into at least generating most of the materials needed by people who create the murals. Answering the mail. Our letters and requests for information and participation go unanswered...in Spain, Dr. Escudero tried so hard to get a UNESCO representative to come to his mural marathon with over 1, 200 children who created 110 murals and no one responded. In Mexico the same happened, as in Austria, etc. Interface with official UNESCO representatives. Other than initial registration, communication has been limited to what comes out in formal mass email messages to those of us listed. Ambassador Chowdhury has been the ONLY accessible high level representative who not only has met with us, but responds to our email! Lack of recognition, local endorsement and attendance by UNESCO officials in locations where we paint murals, even when significant media is present. has been a problem for people who work hard at organizing and sponsoring these events...and they are huge, colorful and positive events that would reflect well on UNESCO and the UN. This is an area I always fault the UN with...they could capitalize on the good things that happen out here in the real world, and especially for projects like ours where we have never requested funding of any kind from the UN. It is disappointing and the press always asks if there is a UN person present. The marathons have never been attended by a UNESCO rep with the exception of Mrs. Breines in Pakistan. Lack of political power to get an exhibition at the UN. Art Miles is an incredible project, yet we have not been able to get an exhibition in the UN in New York City because it requires so much political influence and knowing someone. We formally organized and operate a non profit organization to focus our efforts on creating murals. We became advocates for the Culture of Peace News Network and try to contribute as a regular and trained moderator. and contributing report writer. We have photographed and collected thousands and thousands of photographs of mural painting events. We have been written about in scores of newspapers and magazines, televised often and had radio interviews. We have written over 100 short stories about the mural experiences. we were a main feature of activity during the Kalachakra Peace Festival with His Holiness the Dalai Lama in 2002, and he kindly autographed our murals. We have participated 3x in the Vienna Run For Peace and have painted and exhibited during many candle light vigils. We have tried to collaborate with as many international peace related organizations as possible including the International Education and Resource Network, UNEP, and the International Children's Art Foundation to name but a few. street children in Cusco, Peru painted a mural by candlelight dripping hot wax on the murals because that is when they felt safe to paint. wrote and developed the proposal to bring the UNEP 2004 International Children's Conference on the Environment to New London, CT and for the first time to the USA. 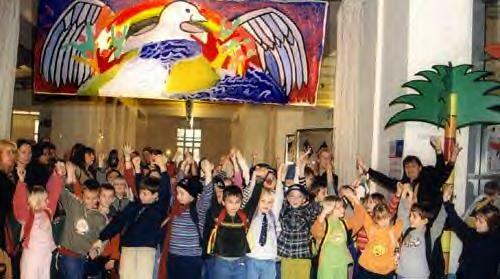 We launched the Peace, Unity and Healing Mural Mile ON SEPTEMBER 11, during the tragedy at Georgetown University as a method for particpants of the Children's Environmental Health Network to release their emotions. We painted murals for peace with street children in Pakistan, with the staff and special support of the Funkor Art Center and the children sewed their mural together. We did murals with children in Dakar, Bangladesh, and the child prodigies of Sofa Ahmed. Just this past week we painted murals and will continue to do so with refugees from the Traiskirchen Refugee Center in Vienna. Shortly thereafter, actress Lindsay Wagner invited Art Miles to paint murals with incarcerated male inmates who are serving sentences and participating in rehab services with her PeaceMakers Community organization and it is a phenomenal experience. The Senior Mural Mile was launched in 2005 in Suffern, New York with over 30 murals exhibited in a public park there. The Blind Institute in Vienna celebrated their 200th Birthday with a mural marathon and exhibition in their facility. We have always celebrated this day on September 21st simultaneously and in various parts of the world and have a significant number of murals to prove it. We are proud of our accomplishments here and one significant mural we have from that day was done in Washington Park in the dark and is 120 feet long. Our milestones are to create one mural at a time, one mile at a time. We never dreamt it would be twelve miles and growing! We also have planned for the installation of a Peace Pole in Austria in the coming year, participation in The Great Wall Mural and have done a complete planning effort to prepare for the next five years. Our MOST IMPORTANT event in addition to painting murals and doing marathons, is our collaborative effort as co-sponsors/collaborators with the Akwesasne Mohawk Territories to host a 2006 International Indigenous Youth Peace Summit and to establish a sustainable Peace Village. This is one of many photos on the website of the Art Miles Mural Project. I believe that the UN and UNESCO officials should attend functions and recognize the organizers in any capacity possible. This is not for me...but for those who really are on the ground and out in the field. There should be some kind of formal communication in addition to CPNN and the mid-year report. I find this so unbelievable that resolutions are passed but no one except CPNN seems to be interested in follow up. I also believe awards should be given to recognize excellent Decade projects and when possible even a token amount of funding to let one know that they believe in and support our projects. We are very proud to be UN and UNESCO supporters, but no one answers any of our letters except Ambassador Anwarul Chowdhury. We have planned mural marathons for Egypt, Denver, Colorado, Atlanta, Georgia, Miami, Florida, Angola, Indiana, Beijing, China, and Vienna, Austria leading up the end of the Decade. We hope to unveil all twelve miles of murals together around the Great Pyramids of Egypt in 2010. We plan to develop products from our murals and establish a foundation to "give back" to those organizations who need help and have helped us. We will continue to do murals for Beslan and Tsunami victims and in other places that need activities for therapy and healing, that promote the Decade of the Culture of Peace and bring people together. We will continue to create murals in villages from Nepal to cities in Europe, and in Latin and North America. Our major event will be the International Indigenous Youth Peace Summit in Akwesasne Mohawk Territories in August 2006.